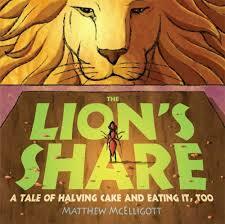 See lesson descriptions using the Story Problem thinkboard for ideas for this book. This lesson includes a mixture of addition and subtraction story problems with result unknown and sums or differences with decimal numbers. Problems at lower levels can be found in grades 2 to 4. This lesson includes a mixture of addition and subtraction story problems (result unknown, change unknown and start unknown) based on the new Michael Phelps book, How to Train with a T.Rex and Win 8 Gold Medals. See grades 2, 3 and 4 for simpler versions of the problems. Diversity tip: Prepare copies of the grade 2, 3 or 4 cards as well, so that children who aren't ready to work with decimal numbers can solve the problems without tripping up on numbers too difficult for them. They love the challenge of working up to 'just right' numbers for them. Multiplication It is important that students understand several models of multiplication; skip counting (repeat addition), groups of, rows of (array/area), multiples and factors. 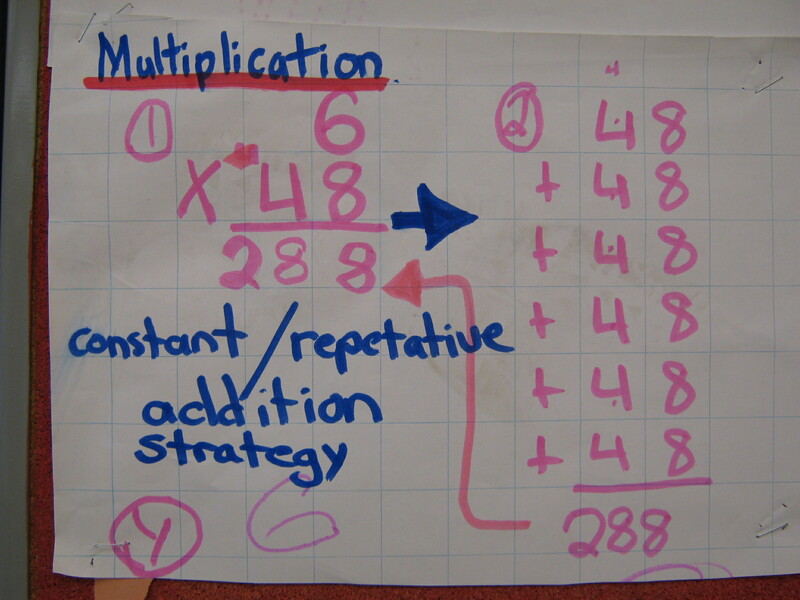 A solid base with the concepts and recall of multiplication is important. 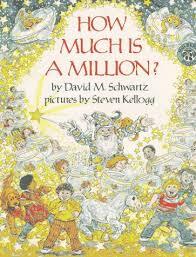 A thought provoking game that reinforces MULTIPLES, FACTORS, RELATED FACTS, DOUBLES AND HALVES. How Many Jelly Beans? 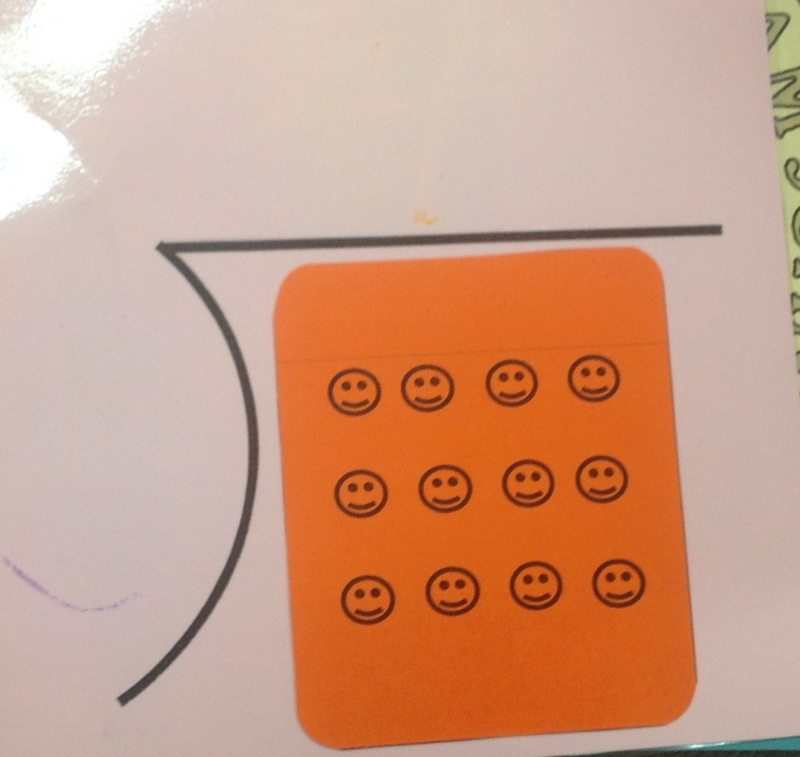 by Andrea Menotti - Representing large numbers with additive and multiplicative thinking Representing numbers to 1 000 000 can be fun with this book. 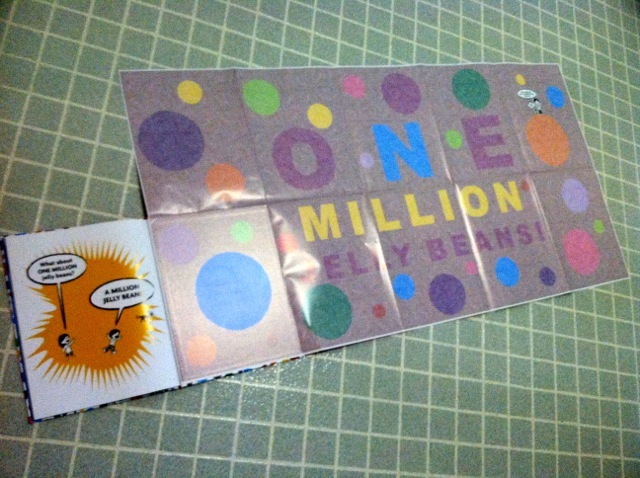 The thinking mat allows students to display a variety of ways to represent the number of their jelly beans - pick just-right numbers. 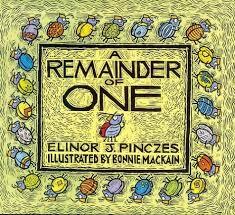 The book has many applications and would also be great for skip counting, estimating, adding/subtracting stories, discussions.... Thanks to Doug David and Puntledge students for all your help with this! BC PLOs A1, A3, A4. "I have...Who Has" - a class game to practice saying, hearing and reading decimal numbers. After practicing as a whole class, Jaki has two of these games operating at once and 1/2 the class competes with the other 1/2 to see who can finish first. This takes careful listen and careful reading of the numbers. 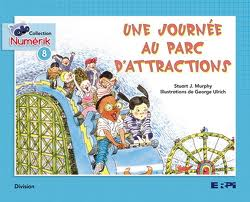 Division Introduction - Use Stuart Murphy's Divide and Ride picture book to introduce the concept and vocabulary for division. Division Lesson Three - Focus on Base 10 Blocks to help Mr. Hoppy figure out how many trips to carry tortoises home in a basket. The humourouse book, Esio Trot by Roald Dahl is a great tie in to this lesson and will provide more context for division. 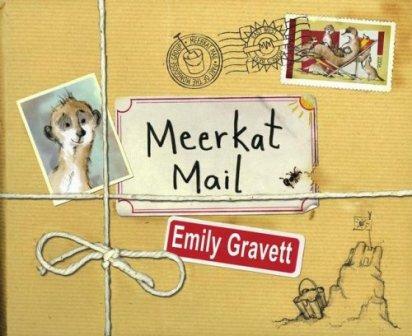 Division Lesson Four - Meerkat Mail by Emily Gravett or Chers maman et papa (French Version) provides the context for further division practice. Division Lesson Five - The Garbage Barge is a new book in our district that provides insight into a 'real' garbage problem. 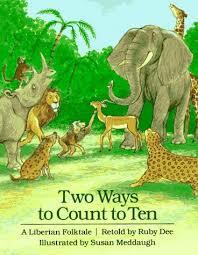 We used the context of this book by Jonah Winter to create the student division activities. Thanks Lazo grade fives for letting me test this one on you! This lesson series breaks down the instructional steps in multiplication as an array model and connecting it to division. The lessons include the model of gradual release, real-world contexts and concrete/ pictorial/ abstract representations. Students will be able to compare and contrast the operations of multiplication and division, use partial products / distributive property and explain why the steps in the division algorithm work! Fraction concept development is very important. We need to make sure that fractions are presented as parts of a whole (with the whole in MANY different shapes - not just pizza) as well as parts of a set. 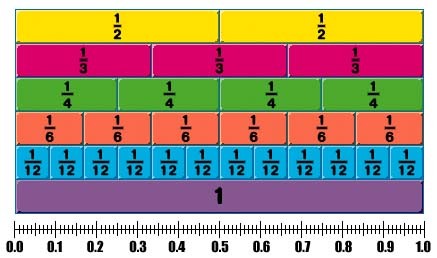 In grade four, fractions also need to be understood on a numberline. 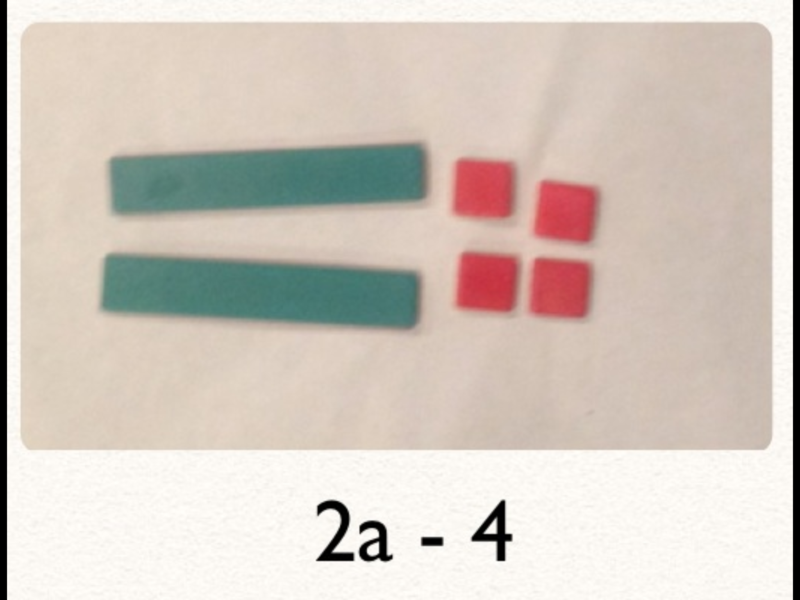 In grade five, we need to make sure work with equivalent fractions is at a concrete and pictorial level. The grade fives at Brooklyn/Lazo are feeling very confident about their multiplication skills after working on this series of lessons. The Multiplication Tic Tac Toe gave students a lot of choice which helped to address the diversity in the class. The criteria has been provided as an example only. The power of the criteria is in creating it WITH the students. Thanks Lynn and Sarah for sharing with us. 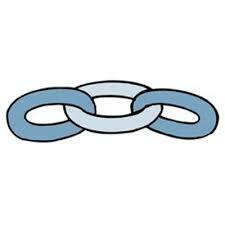 Diversity tip: Clear learning intentions and co-constructed criteria coupled with an open-ended task helps to address diversity with this 'tested' lesson series. High quality work with thoughtful explanation were evident in the work done by Brooklyn/Lazo's Grade 5's. Equations, Balance, Variables and Algebra Tiles This lesson shows how students can represent and solve for unknown numbers by using the idea of balance (same as / equality), concrete shapes, variables and then algebra tiles to build their understanding about algebra.